What do some of the characteristics of Marfan syndrome look like (pictures)? What types of doctors treat Marfan syndrome? What treatment options are available for Marfan syndrome? What are some of the emotional and psychological effects of Marfan syndrome? What research is being conducted on Marfan syndrome? Where can people find additional information about Marfan syndrome? Marfan syndrome is a disease of connective tissues that is inherited. The severity of Marfan syndrome varies from one individual to another and it typically progresses over time. A tall, slender build is characteristic of Marfan syndrome. Marfan syndrome affects the skeleton, eyes, heart and blood vessels, nervous system, skin, and respiratory system. Marfan syndrome can cause dislocation of the lens of the eye and detachment of the retina, resulting in vision loss in patients with the condition. The child of a patient with Marfan syndrome has a 50% chance of have the disease. Mitral valve prolapse is common in patients with Marfan syndrome. Abnormal aortic dilation (aortic aneurysm) can be a serious manifestation of Marfan syndrome. The syndrome is caused by a defect, or mutation, in the gene that determines the structure of fibrillin-1, a protein that is an important part of connective tissue. There is no specific laboratory test, such as a blood test or skin biopsy, to diagnose Marfan syndrome. The doctor and/or geneticist (a doctor with special knowledge about inherited diseases) relies on observation and a complete medical history and examination. There is no cure for Marfan syndrome. However, a range of treatment options are designed to minimize and prevent complications. What do some of the characteristics and symptoms of Marfan syndrome look like (pictures)? One characteristic or symptom of Marfan syndrome is skin tumors, called syringomas. 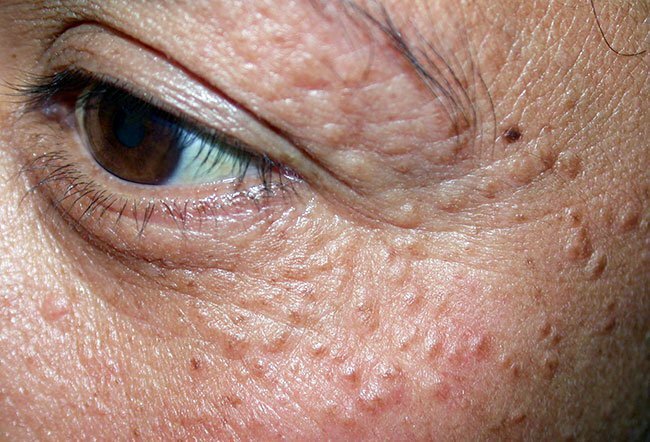 Syringomas occur most commonly around the eyes and eyelids, but other areas of the body can be affected. Marfan syndrome is a heritable condition that affects the connective tissue. The primary purpose of connective tissue is to hold the body together and provide a framework for growth and development. In Marfan syndrome, the connective tissue is defective and does not act as it should. Because connective tissue is found throughout the body, the syndrome can affect many body systems, including the skeleton, eyes, heart and blood vessels, nervous system, skin, and lungs. Marfan syndrome affects men, women, and children, and has been found among people of all races and ethnic backgrounds. Skeleton. People with the syndrome are typically very tall, slender, and loose-jointed. Because Marfan syndrome affects the long bones of the skeleton, a person's arms, legs, fingers, and toes may be disproportionately long in relation to the rest of the body. A person with the syndrome often has a long, narrow face, and the roof of the mouth may be arched, causing the teeth to be crowded. Other skeletal problems include a sternum (breastbone) that is either protruding or indented, curvature of the spine (scoliosis), and flat feet. Eyes. More than half of all people with the condition experience dislocation of one or both lenses of the eye. The lens may be slightly higher or lower than normal, and may be shifted off to one side. The dislocation may be minimal, or it may be pronounced and obvious. One serious complication that may occur with this disorder is retinal detachment. Many people with the condition are also nearsighted (myopic), and some can develop early glaucoma (high pressure within the eye) or cataracts (the eye's lens loses its clearness). Heart and blood vessels (cardiovascular system). Marfan syndrome patients have problems associated with the heart and blood vessels. Because of faulty connective tissue, the wall of the aorta (the large artery that carries blood from the heart to the rest of the body) may be weakened and stretch, a process called aortic dilatation. Aortic dilatation increases the risk that the aorta will tear (aortic dissection) or rupture, causing serious heart problems or sometimes sudden death. Sometimes, defects in heart valves can also cause problems. In some cases, certain valves may leak, creating a "heart murmur," which a doctor can hear with a stethoscope. Small leaks may not result in any symptoms, but larger ones may cause shortness of breath, fatigue, and palpitations (a very fast or irregular heart rate). Nervous system. The brain and spinal cord are surrounded by fluid contained by a membrane called the dura, which is composed of connective tissue. Marfan syndrome patients grow older, the dura often weakens and stretches, then begins to weigh on the vertebrae in the lower spine and wear away the bone surrounding the spinal cord. This is called dural ectasia. These changes may cause only mild discomfort; or they may lead to radiated pain in the abdomen; or to pain, numbness, or weakness in the legs. Skin. Many people with Marfan syndrome develop stretch marks on their skin, even without any weight change. These stretch marks can occur at any age and pose no health risk. However, people with Marfan syndrome are also at increased risk for developing an abdominal or inguinal hernia, in which a bulge develops that contains part of the intestines. Lungs. Although connective tissue problems make the tiny air sacs within the lungs less elastic, people with Marfan syndrome generally do not experience noticeable problems with their lungs. If, however, these tiny air sacs become stretched or swollen, the risk of lung collapse may increase. Rarely, people with Marfan syndrome may have sleep-related breathing disorders such as snoring, or sleep apnea (which is characterized by brief periods when breathing stops). Is Marfan syndrome genetic or inherited (causes)? Marfan syndrome is caused by a defect, or mutation, in the gene that determines the structure of fibrillin-1, a protein that is an important part of connective tissue. A person with Marfan syndrome is born with the disorder, even though it may not be diagnosed until later in life. The defective gene that causes Marfan syndrome can be inherited: The child of a person who has Marfan syndrome has a 50 percent chance of inheriting the disease. Sometimes a new gene defect occurs during the formation of sperm or egg cells, making it possible for two parents without the disease to have a child with the disease. But this is rare. Two unaffected parents have only a 1 in 10,000 chance of having a child with Marfan syndrome. Possibly 25 percent of cases are due to a spontaneous mutation at the time of conception. Although everyone with Marfan syndrome has a defect in the same gene, different mutations are found in different families, and not everyone experiences the same characteristics to the same degree. In other words, the defective gene expresses itself in different ways in different people. This phenomena is known as variable expression. Scientists do not yet understand why variable expression occurs in people with Marfan syndrome. Are there tests to diagnose Marfan syndrome? Information about any family members who may have the disorder or who had an early, unexplained, heart-related death. A thorough physical examination, including an evaluation of the skeletal frame for the ratio of arm/leg size to trunk size. An eye examination, including a "slit lamp" evaluation. Heart tests such as an echocardiogram (a test that uses ultrasound waves to examine the heart and aorta). The doctor may diagnose Marfan syndrome if the patient has a family history of the disease, and if there are specific problems in at least two of the body systems known to be affected. For a patient with no family history of the disease, at least three body systems must be affected before a diagnosis is made. Moreover, two of the systems must show clear signs that are relatively specific for Marfan syndrome. In some cases, a genetic analysis may be useful in making a diagnosis of Marfan syndrome, but such analyses are often time consuming and may not provide any additional helpful information. Family members of a person diagnosed with Marfan syndrome should not assume they are not affected if there is no knowledge that the disorder existed in previous generations of the family. After a clinical diagnosis of a family member, a genetic study might identify the specific mutation for which a test can be performed to determine if other family members are affected. Recently, doctors discovered a connective tissue disorder known as Loeys-Dietz syndrome, which has several characteristics that overlap with those of Marfan syndrome. When making a diagnosis, it is important to distinguish between the two disorders: Loeys-Dietz is more likely to cause fatal aortic aneurysms, and treatment for the two is different. A diagnostic test for Loeys-Dietz syndrome is available. What types of doctors or other health care professionals treat Marfan syndrome? Because a number of body systems may be affected, a person with Marfan syndrome should be cared for by several different types of doctors. A general practitioner or pediatrician may oversee routine health care and refer the patient to specialists such as a cardiologist (a doctor who specializes in heart disorders), an orthopaedist (a doctor who specializes in bones), or an ophthalmologist (a doctor who specializes in eye disorders), as needed. Some people with Marfan syndrome also go to a geneticist. How is Marfan syndrome treated, and can it be cured? There is no cure for Marfan syndrome. To develop one, scientists may have to identify and change the specific gene responsible for the disorder before birth. However, a range of treatment options can minimize and sometimes prevent complications. The appropriate specialists will develop an individualized treatment program; the approach the doctors use depends on which systems have been affected. Skeletal. Annual evaluations are important to detect any changes in the spine or sternum. This is particularly important in times of rapid growth, such as adolescence. A serious malformation not only can be disfiguring, but also can prevent the heart and lungs from functioning properly. In some cases, an orthopaedic brace or surgery may be recommended to limit damage and disfigurement. Eyes. Early, regular eye examinations are essential for identifying and correcting any vision problems associated with Marfan syndrome. In most cases, eyeglasses or contact lenses can correct the problem, although surgery may be necessary in some cases. Heart and blood vessels. Regular checkups and echocardiograms help the doctor evaluate the size of the aorta and the way the heart is working. The earlier a potential problem is identified and treated, the lower the risk of life-threatening complications. Those with heart problems are encouraged to wear a medical alert bracelet and to go to the emergency room if they experience chest, back, or abdominal pain. Some heart-valve problems can be managed with drugs such as beta-blockers, which may help decrease stress on the aorta. In other cases, surgery to replace a valve or repair the aorta may be necessary. 1 All medicines can have side effects. Some medicines and side effects are mentioned in this publication. Some side effects may be more severe than others. You should review the package insert that comes with your medicine and ask your health care provider or pharmacist if you have any questions about the possible side effects. Surgery should be performed before the aorta reaches a size that puts it at high risk for tear or rupture. Because blood clots can form around artificial heart valves, people who have a valve replaced must take the blood-thinning drug warfarin for the rest of their lives. They must also take extreme care to prevent endocarditis (inflammation of the lining of the heart cavity and valves). Dentists should be alerted to this risk; they are likely to recommend that the patient be prescribed protective medicines before they perform dental work. Because warfarin carries a risk of some serious side effects, including excessive bleeding, and because it is dangerous to unborn babies, doctors are increasingly opting for a newer aortic root replacement procedure that enables people to keep their own valves. The procedure involves removing and replacing the enlarged part of the aorta with a Dacron tube, and resuspending the natural valve into the tube so that the tube supports the valve. The procedure is often performed at an earlier stage than traditional valve replacement. It may also be offered to women with aortic enlargement who are considering becoming pregnant, because it can prevent the rapid aortic growth and possible tearing that sometimes occur during pregnancy. Nervous system. If dural ectasia (swelling of the covering of the spinal cord) develops, medication may help minimize any associated pain. Lungs. It is especially important that people with Marfan syndrome not smoke, as they are already at increased risk for lung damage. Any problems with breathing during sleep should be assessed by a doctor. Pregnancy poses a particular concern due to the stress on the body, particularly the heart. A pregnancy should be undertaken only under conditions specified by obstetricians and other specialists familiar with Marfan syndrome. In some cases, valve surgery prior to pregnancy may be warranted. The pregnancy should be monitored as a high-risk condition. Women with Marfan syndrome may also seek genetic counseling concerning the likelihood that they will pass the disease on to their children. Although eating a balanced diet is important for maintaining a healthy lifestyle, no vitamin or dietary supplement has been shown to help slow, cure, or prevent Marfan syndrome. For most people with Marfan syndrome, engaging in moderate aerobic exercise is important for promoting skeletal and cardiovascular health and a sense of well-being. However, because of the risk of aortic dissection, people with the syndrome should not engage in contact sports, competitive athletics, or isometric exercise. Being diagnosed and learning to live with a genetic disorder can cause social, emotional, and financial stress. It often requires a great deal of adjustment in outlook and lifestyle. A person who is an adult when Marfan syndrome is diagnosed may feel angry or afraid. There may also be concerns about passing the disorder to future generations or about its physical, emotional, and financial implications. The parents and siblings of a child diagnosed with Marfan syndrome may feel sadness, anger, and guilt. It is important for parents to know that nothing that they did caused the fibrillin-1 gene to mutate. Parents may be concerned about the genetic implications for siblings or have questions about the risk to future children. Some children with Marfan syndrome are advised to restrict their activities. This may require a lifestyle adjustment that is hard for a child to understand or accept. For both children and adults, appropriate medical care, accurate information, and social support make it easier to live with the disease. Genetic counseling may also be helpful for understanding the disease and its potential impact on future generations. While Marfan syndrome is a lifelong disorder, the outlook has improved in recent years. As early as the 1970s, the life expectancy of a person with Marfan syndrome was two-thirds that of a person without the disease; however, with improvements in recognition and treatment, people with Marfan syndrome now have a life expectancy similar to that of the average person. Where can I find information about clinical trials and research that's being conducted on Marfan syndrome? Several years ago, National Institutes of Health (NIH)-funded researchers found that losartan, a common blood pressure medication, also affected a molecular pathway involved in aortic weakening and rupture, an often fatal complication of Marfan syndrome. Numerous studies are underway that should lead to a better understanding of Marfan syndrome and its treatment. They include a plan to identify the factors responsible for the cardiovascular manifestations of Marfan syndrome, a study to better understand the process that leads to skeletal manifestations, and studies to clarify the role of a chemical messenger called transforming growth factor-beta (TGF-β) in the disorder. Some of the most recent studies are identifying new potential therapeutic targets for Marfan syndrome. Scientists are conducting research on Marfan syndrome from a variety of perspectives. One approach is to better understand what happens once the genetic defect or mutation occurs. How does it change the way connective tissue develops and functions in the body? Why are people with Marfan syndrome affected differently? Scientists are searching for the answers to these questions both by studying the genes themselves and by studying large family groups affected by the disease. Mouse models that carry mutations in the fibrillin-1 gene may help scientists better understand the disorder. Animal studies that can provide preliminary information for gene therapy are also underway. Other scientists are focusing on ways to treat some of the complications that arise in people with Marfan syndrome. Clinical studies are being conducted to evaluate the usefulness of certain medications in preventing or reducing problems with the aorta. The NIAMS gratefully acknowledges the assistance of the following individuals in the preparation and review of the original version of this booklet: Bernadette Tyree, Ph.D., NIAMS/ NIH; Priscilla Ciccarielo, Director Emeritus, National Marfan Foundation, Port Washington, NY; Harry C. Dietz, M.D., Johns Hopkins University School of Medicine, Baltimore, MD; Carolyn Levering and Eileen Masciale, National Marfan Foundation, Port Washington, NY; Francisco Ramirez, M.D., Mount Sinai School of Medicine of the City University of New York, NY; and Joel Rosenbloom, M.D., Ph.D., University of Pennsylvania, Philadelphia, PA.
Syringoma Image Source: Color Atlas of Pediatric Dermatology Samuel Weinberg, Neil S. Prose, Leonard Kristal Copyright 2008, 1998, 1990, 1975, by the McGraw-Hill Companies, Inc. All rights reserved. Please describe your experience with marfan syndrome. What was the cause of your Marfan syndrome? What kinds of treatment have you or someone you know undergone for Marfan syndrome? What symptoms do you experience with Marfan syndrome? How do you cope with them? A benign (non-cancerous) skin tumor that derives from eccrine cells, specialized cells that are related to sweat glands. See a picture of Syringoma and learn more about the health topic.